Although the IIoT is poised to reshape factory automation, transportation, energy, and other industrial markets through the application of intelligence and connectivity, the embedded systems that power these segments are still governed by longevity, reliability, and low power consumption. Meanwhile, however, the use of higher precision sensors, growing demand for video and graphics capability, and the desire for local analytics processing are driving an exponential demand for performance. As usual, it is the responsibility of embedded – and now IoT – designers to balance these wants with size, weight, power, and cost (SWaP-C) thresholds. In addition, critical industries typically call for solutions that can be integrated into existing systems without extensive reengineering. At the intersection of these requirements lies the proven, compact, and easily expandable PC/104 standard. Aside from its small footprint and low power consumption, close cooperation between component suppliers and board designers has resulted in a stackable architecture that has risen to the design challenges of each of the last three decades (Figure 1). Now equipped with next-generation I/O and support for modern processors, PC/104 is primed to upgrade the installed base of industrial systems with IIoT capabilities. Figure 1. PC/104's rugged and modular architecture allows developers to add functionality by merely adding a board to the stack (Source: PC/104 and Small Form Factors). In keeping with Moore’s Law, the drive for more computational power, and therefore the need for faster data links, the PC/104 family of specifications has consistently incorporated new I/O technologies since its inception in 1987. As shown in Figure 2, this evolution has included the addition of PCI and PCI Express (PCIe) interfaces from the original ISA bus foundation. Figure 2. The PC/104 family of specifications has provided a stepping stone to higher performance embedded systems since 1987. Now, it is enabling these systems to transition to IIoT (Source: PC/104 Consortium). The progression of PC/104 technology also coincides with rising bandwidth requirements in industrial systems, which now employ multi-core system on chips (SoCs) to support additional sensors and connectivity as part of the IIoT infrastructure. For designers looking to scale existing designs to support these capabilities, PC/104-Plus and PCI/104-Express provide ideal bridge technology. PCI/104-Express, for example, supports not only PCIe, but high-speed interfaces like USB, SATA, and Gigabit Ethernet (GbE) as well. These interfaces, along with a higher level of signal integrity in the PCI/104-Express specification, ease integration of next-generation I/O peripherals and eliminate the need for re-engineering when adding modules to the stack. And, with PC/104-compatible peripheral modules for almost any required capability, designers can move quickly from industrial to IIoT. The ability to add functionality by stacking peripheral modules on top of a processor baseboard has helped PC/104 maintain its popularity over the years. In addition to providing a platform for new technologies, corner mounting holes and stack-through connectors on each board, excepting the base, means that legacy systems built on PC/104 technology can be upgraded easily – even across vendors. For industrial engineers looking to transition their systems to IIoT readiness, today’s PC/104 peripheral modules offer features ranging from intelligent data acquisition to Wi-Fi connectivity to high-resolution imaging over GbE and more. Below are a few use cases that demonstrate how the compact and rugged PC/104 form factor can be leveraged to quickly add design capabilities. PC/104's flexible I/O architecture can be coupled with modern processors for high-capture rate data acquisition systems, with a high-speed camera and frame grabber providing a good example. Here, a PCIe/104 card can be used to facilitate multiple camera connections, while also controlling the high-speed bus. Such flexibility is possible because high-speed processing and specific peripheral circuitry can co-exist on the same PC/104 board. One PCIe/104 data acquisition I/O card that integrates analog I/O technology with a PCIe interface is the E104-DAQ1616 module from Diamond Systems Corporation. The module supports all data acquisition functions, including analog-to-digital (A/D), digital-to-analog (D/A), digital input/output (DIO), and counters/timers. The board also supports the PCI-104 connector footprint as an option for communication with PCI-104 cards within existing stacks (Figure 3). Figure 3. 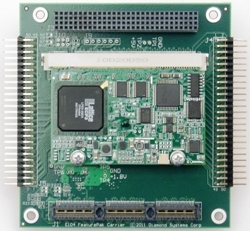 The PCI-104 connector footprint is included on Diamond Systems Corporation's E104-DAQ1616 analog I/O module to support pass-through communications with other PCI-104 modules in a stack (Source: Diamond Systems Corporation). Aside from advanced processors, industrial applications like remote surveillance and traffic monitoring demand high-speed video packet streaming. Support for GbE, USB, and low power consumption in the PCI/104-Express and PCIe/104 deliver on these requirements in spades. The LAN25222HR and LAN35222HR dual GbE modules from RTD Embedded Technologies provide GbE communications over the PCI/104-Express and PCIe/104 architectures, respectively. Driven by the Intel® 82574IT GbE controller, these modules each offer two GbE connections and 10/100/1000 Mbps RJ45 communications on each channel. Figure 4. 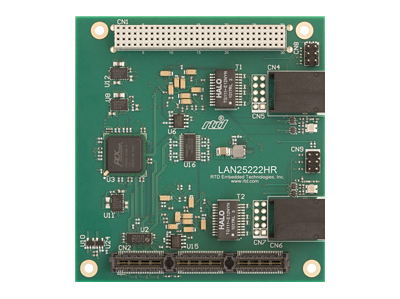 RTD Embedded Technologies’ LAN25222 PCI/104-Express module delivers a throughput increase in applications like video surveillance with support for GbE, PCIe, and USB (Source: RTD Embedded Technologies). When deployed in video applications, the RTD boards perform tasks like data offloading and frame grabbing by providing desktop-level performance in a PC/104 form factor. Dual GbE interfaces, a host of other I/O, and onboard Trusted Platform Module (TPM) make it a potential centerpiece for connected industrial designs that require high levels of data integrity and security. Meanwhile, WinSystems’ PX1-C415 PCIe/104 SBC based on the Intel Apollo Lake-I E3900 processor delivers dual GbE and a range of additional I/O through the OneBank expansion connector. The boards also include a trusted platform module (TPM), making it a seamless choice for small form factor, rugged Industrial IoT communications systems that handle sensitive data. Wi-Fi is increasingly becoming the communication channel of choice for non-real-time applications in industrial environments like factory floors. 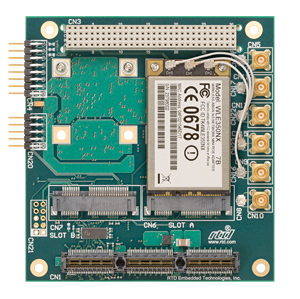 Here again, PC/104's stackable architecture allows designers to seamlessly incorporate Wi-Fi modules or subsystems into existing industrial designs. For instance, RTD Embedded Technologies offers PCI/104-Express and PCIe/104 Mini-PCIe card carrier modules for embedding Wi-Fi functionality into industrial applications, namely, the WLAN25203ER and WLAN35203ER. Both of these Wi-Fi solutions incorporate Atheros wireless LAN (WLAN) modules compliant with the 802.11a/b/g/n standards. Figure 6. 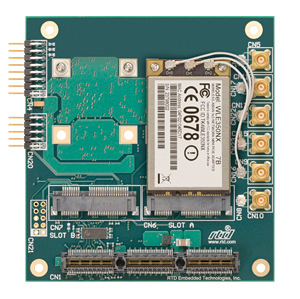 Wi-Fi card carriers like the WLAN25203ER (top) and WLAN35203ER (bottom) from RTD Embedded Technologies can boost PC/104 stack capabilities by connecting them to wireless IIoT networks (Source: RTD Embedded Technologies). The dual-slot Mini-PCIe card carriers support both Type 1, Type 2, and universal PCI/104-Express and PCIe/104 expansion pinout options. Type 1 features PCIe x1 and x16 links with USB 2.0, while Type 2 supports PCI Express x1 and x4 links with USB 3.0 and SATA for the latest peripheral devices. The universal pinout supports PCIe x1 and/or USB 2.0. At a time when the brave new world of graphics and displays is converging with IIoT designs, x86 processors with powerful CPUs and video processing capabilities are becoming increasingly prominent. These processors offer more compute performance, higher resolution graphics, and faster I/Os than previous-generation industrial CPUs while also consuming less power. Originally designed with support for x86 processors in mind, PC/104 is already positioned to perform these workloads. VersaLogic’s PC/104-Plus Liger board is a case in point, featuring a seventh-generation Intel® Core processor based on the Kaby Lake microarchitecture. The mix of traditional I/O and advanced processing performance on the Liger offers the ability to upgrade legacy industrial designs while preserving connectivity with already-deployed modules or custom peripherals. The Liger also integrates a Trusted Platform Module (TPM) security chip directly onto the printed circuit board (PCB) that provides hardware-level security and prevents unauthorized access for sensitive industrial applications. Figure 7. 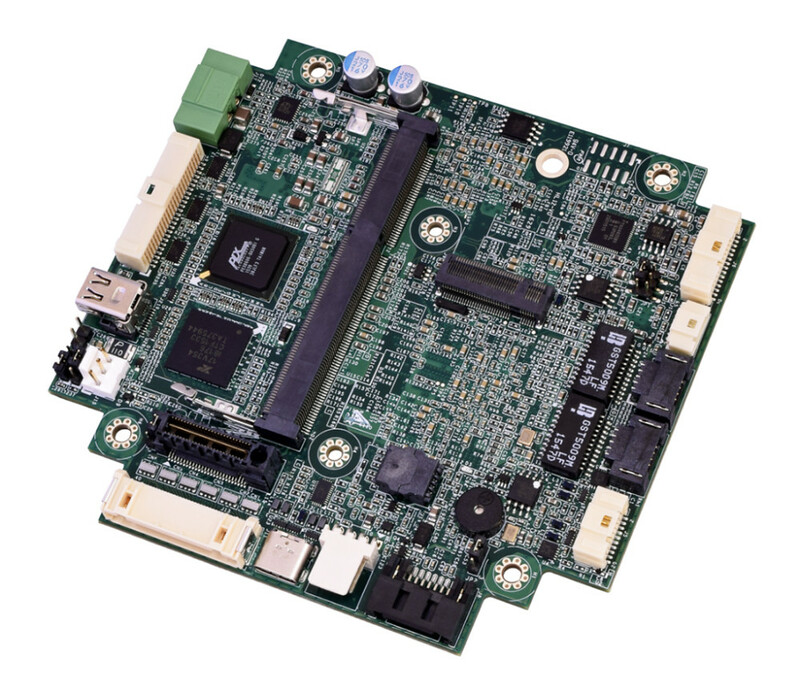 The Liger EPM-43 from VersaLogic is PC/104-Plus expansion board that makes it easy to upgrade systems to seventh-generation Intel® Core processor technology (Source: VersaLogic Corp.). The existing design infrastructure around x86 processors and associated software complements PC/104’s versatility by enabling emerging functionality and maintaining compatibility with existing solutions. The combined ecosystem also offers a powerful platform on top of which industrial developers can customize their designs to meet specific requirements. A dense mix of I/O interfaces, wired and wireless connectivity mechanisms, and expansion options in a small form factor continue to enable PC/104 technology in embedded systems ranging from resource-constrained control systems to high-performance IIoT solutions. By providing support for advanced processors and high-speed interfaces while still delivering on the promise of reliability and long lifecycle operation, PC/104 developers can depend on their investment well into the future. With an architecture that allows industrial designers to quickly deliver more performance and new functionality, there is no need to design new modules, source additional modules, or rebuild entire systems from scratch. For organizations looking to take advantage of IIoT without massive investment or significant downtime, it’s time to get reacquainted with PC/104. To join the Industrial IoT revolution, visit the PC/104 Consortium at www.pc104.org. 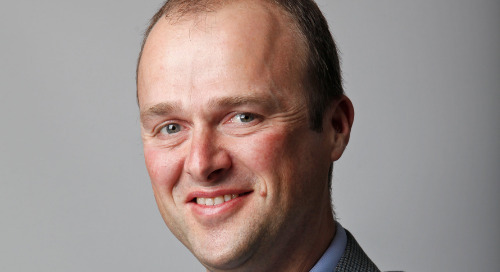 Jeff Milde is Executive Director of the PC/104 Consortium. The advanced 5G features and capabilities for IoT, intelligent edge, and AI/IVR are very real and attention should be paid to 5G network architecture in order to take advantage. As the autonomous vehicle functions allow drivers and passengers to increasingly devote their attention to something other than the road, infotainment systems will become the focal point. More and better tools, and more and better components, mean the role of the electronic systems designer is migrating from a “roll your own” to a systems integration paradigm. IoT and AI benefit from the cost and flexibility of general-purpose CPUs, but also need advanced signal processing to clean analog inputs and perform MAC operations with high precision and efficiency. An EV That Charges Itself? Hyundai and Kia May Make It Happen! Hyundai and Kia have joined forces on developing the Automated Valet Parking System (AVPS), which combines autonomous driving and wireless charging. 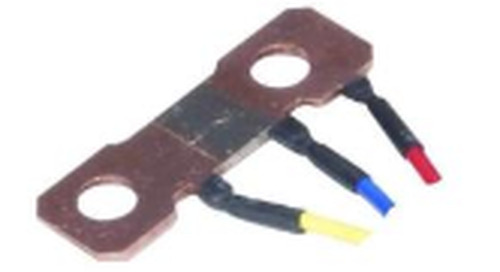 Sensing of current magnitude is critical in many applications and often done by measuring the voltage across a shunt resistor, but even this simple technique has subtleties and issues to resolve. New Sense2Grow platform utilizes LoRaWAN to access critical data to ensure optimal growing conditions. 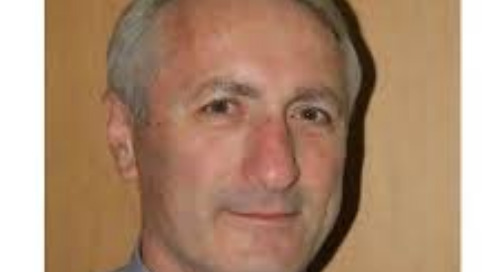 With USB Type-C solutions gaining critical mass, Embedded Computing Design asks Andrew Cowell of Renesas Electronics what USB-C Power Delivery (PD) features mean for embedded engineers. 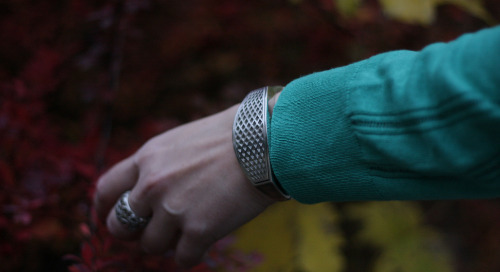 One thing that I’ve learned about ams is that the company is all about sensors. The AS7341 is suited for applications that require color analysis, automatic white balancing and color matching. Z-Wave, represented by the Z-Wave Alliance, has carved out an interesting niche for itself in home automation, as an open standard with more than 2,400 certified interoperable products. my step-counter watch built with an Ambiq processor needs a new battery around once a year. The extreme low power comes from something called Subthreshold Power Optimized Technology. The Speedcore Gen4 architecture adds the Machine Learning Processor (MLP) to the library of available blocks and delivers higher system performance for AI/ML applications. The OPC Foundation recently launched a new taskforce with the goal of integrating OPC UA and TSN to join the industrial enterprise with operational devices in the field. 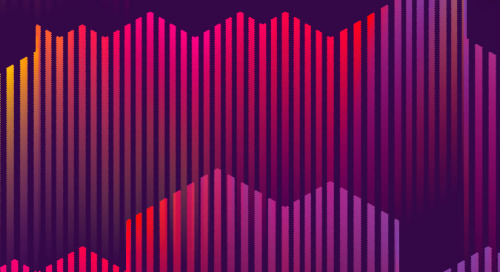 The Qt Company’s annual World Summit hit Berlin last week and the messages delivered were clear: no longer can User Experience (UX) be an afterthought. GE’s Intelligent Platforms group recently unveiled two new control solutions, the CPL410, an outcome-optimizing open controller, and a remote-monitoring service platform, the Equipment Insight 2018.